Ed passed away suddenly on Sunday, July 15, 2012 at the age of 78 years. He will be forever loved and remembered by his wife Bev of 53 years; son, Greg (Andrea) and daughter, Heather (Mike) MacBeath; six grandchildren, Kirsten, Melissa, Drew, Beckett, Ryan and Lauren; nieces, nephews, extended family and many great friends. Ed and Bev lived life to the fullest finding time to enjoy travel, attending many sporting events and quality time with family. His love for his grandchildren was reflected in his unwavering bond and commitment to them. 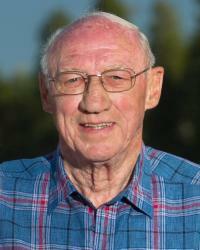 Ed took great pride in his career and lead Levitt Safety’s Western Region for over 30 years. He valued the many relationships he developed along the way. From 1986 to 2012, Ed enjoyed golf, volleyball and exercise with his friends at the Cardiac Athletic Society Edmonton. Ed was full of positive energy, had a great passion for life and brought a smile to everyone he touched. A Memorial Service will be held at Foster and McGarvey Funeral Home, 10011 - 114 Street, Edmonton on Friday July 20, 2012 at 2:00 p.m.
A heartfelt thank you to Dr. John Clarke and associates.